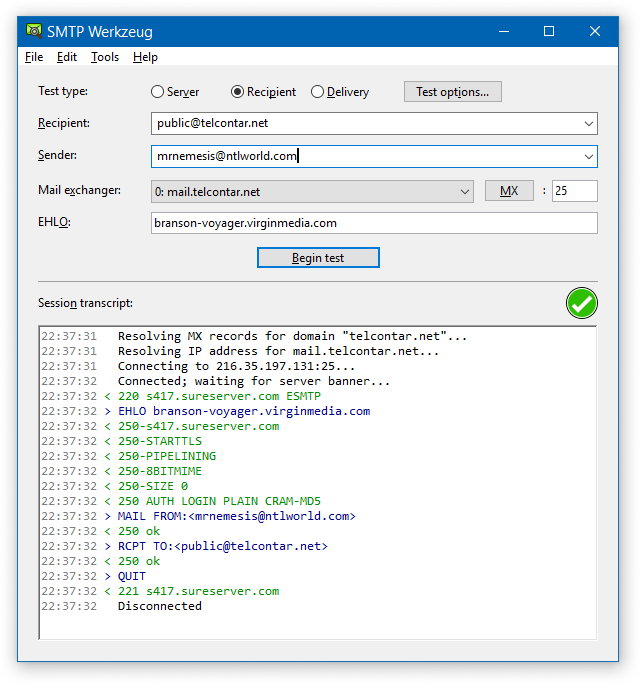 SMTP Werkzeug is an SMTP e-mail message delivery test utility for Windows. 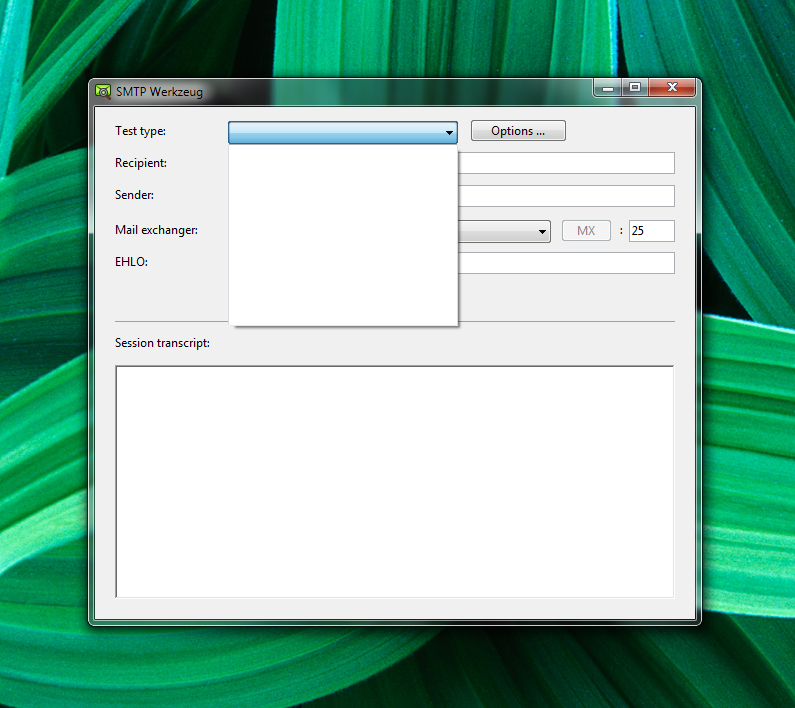 Portable mode is enabled by placing the configuration file (SMTP Werkzeug preferences.xml) in the same directory as the executable. The portable version ships with an empty configuration file for this reason. Normally, the configuration file lives inside %APPDATA%\Telcontar. 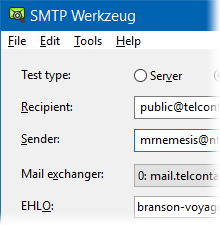 SMTP Werkzeug requires your default nameserver to support TCP DNS lookups: UDP DNS lookups are not supported. This is a limitation of the RBDNS library. I doubt it’s an insurmountable, but I don’t imagine I’ll ever attempt to get UDP DNS working. There is no support for SSL/TLS or STARTTLS. The REALbasic 2006 cypher suite is too old, so I have not attempted to implement secure connections. HTTP Werkzeug does have HTTPS support enabled (confirmed working with an old Linux box) but it will only talk to outdated servers. Making TLS work under a modern REALbasic would be trivial, but implementing STARTTLS would be interesting. No high DPI support: the UI only works at 100% DPI. I suspect that I could fix this if anyone was persuasive enough. I had completely abandoned writing desktop software, because I had yet to find a language and framework that I wanted to invest time and effort in. This remains true to this day. However, I needed this program at work, so I blew the dust off REALbasic Professional 2006 on my old PowerMac G4 450 running Tiger and quickly threw this program together. Since then, it has gained additional functionality and bug fixes, but it also gains all the bugs from REALbasic runtime, of which there are a lot. Since then I have migrated to a much faster Mac mini G4 1.25 GHz acquired from my colleague Russell Brooks, but my development environment remains PPC, and remains Tiger. I use my Windows PC for producting the graphics, however. 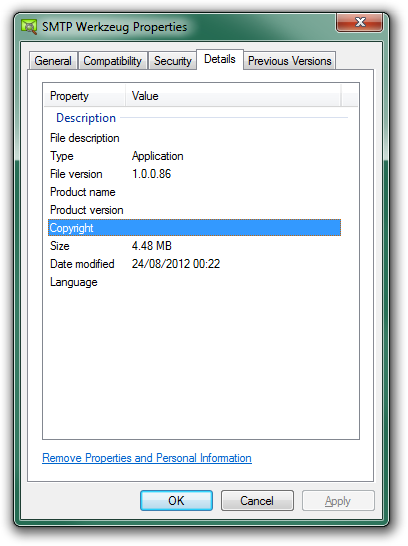 The program itself is used in production in Windows 7, 8 and 10. This does not include the faults I did work around, such as rubbish support for theme-compliant control colours for the classic Windows UI (screenshot depicts correct appearance). Uses the RB DNS public domain, open source resolver library by Will Cannings. SMTP Werkzeug and my associated code library is licensed under the terms of the zLib license.